Beijing is seeking new energy supply routes to its west. Will that influence its eastern strategy? The implication of Xinjiang’s Uighur minority in last October’s Tiananmen Square attacks has showcased Beijing’s failed ethnic policy. The incident not only caused deep shock within the ruling class in China, it has also had an inevitable impact on China’s westward pivot. Most of the world tends to focus on China’s rapid seaward expansion to the east. Besides a strategic ambition of reaching out into the Pacific, China’s obsession with the East China Sea and the South China Sea also reflect a need to secure vital sea lanes for energy shipments from the Middle East. Always energy hungry, the world’s second economic power has for the past several years been quietly exploring new supply routes in addition to the traditional ocean route extending through the Indian Ocean, the Strait of Malacca, the South China Sea and the East China Sea to one of the ports on China’s East Coast. One of the new lines being envisioned is what Chinese President Xi Jinping has called the “New Silk Road,” which extends from China’s western border through Central Asia to the oil-rich Middle East. Eventually, this Silk Road may reach Europe via rail. 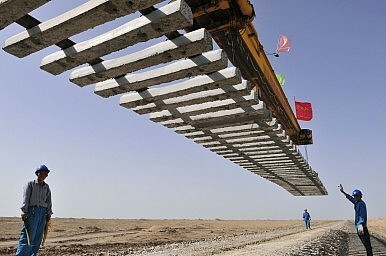 In fact, this grand project is also closely linked to a sweeping shift in China’s internal economic development. The bottom line of China’s westward pivot is a shift in the focus of the country’s economic development from the economically saturated and rich coastal eastern regions towards the inland areas to the west. This shift has become all the more urgent because, as the Tiananmen Square attacks demonstrated, popular discontent in these poor inland regions is rising to dangerous levels. The social disgruntlement can be explained by many factors, including a failed ethnic policy and worsening religious conflict. However, the central government in Beijing seems to believe that it is mainly due to the region’s economic backwardness compared to the industrialized east. It hopes that lavishing economic resources on the poor inland regions will help soothe the worrying social instability. This shift of economic resources has already brought the beginnings of an economic boom in the inland provinces, producing a particularly noticeable impact since 2010. As economic development proceeds in the western interior regions, more workers in these regions have opted to find work locally closer to home instead of migrating to the industrialized coastal regions to the east. This in turn has created a serious labor shortage as well as sharp wage rises in industrial areas such as Shanghai and Canton, contributing to a deterioration in the investment environment in China. As economic activity has picked up in the Chinese interior, energy demand has risen accordingly. This is what has motivated Chinese strategists to explore a more direct supply route overland from the west, instead of the traditional approach of shipping energy resources from Mideast to China’s eastern ports only to ship them again on land to the western regions. This scheme of direct supply from the west entails careful planning and the creation of a favorable international environment in China’s Central Asian neighborhood. China has made a beginning, building an intimate relationship with Pakistan where it last year acquired the right to manage the strategically vital port of Gwadar at the mouth of the Persian Gulf. Beijing has also given special attention to strengthening the solidarity of the Shanghai Cooperation Organization, which groups, besides China and Russia, all the Central Asian states. President Xi Jinping has recently toured these countries and returned with important energy deals as well as pledges of increased economic and security cooperation. This effort also extends to improving ties with Afghanistan as U.S.-led forces withdraw. It is not often remarked, but China is an immediate neighbor of Afghanistan. The two countries share a narrow border at the Wakhan Corridor, which is 60 km north-south and 120 km east-west. Viewed from China, the oil-rich Middle East is only a few hundred kilometers away. This geographic particularity has Chinese strategists dreaming of one day building a pipeline from Iran, across Afghanistan, into China’s Xinjiang. When the fighting in Afghanistan began in 2001, China was quite uncomfortable with the presence of a huge U.S. armada in its backyard. But it soon realized that U.S. anti-terrorist operations in Afghanistan played to China’s own advantages. In fact, as the recent Tiananmen incident demonstrated, China has long been confronted with a militant movement for independence among the Muslim Uyghur minority in Xinjiang. And the Beijing regime has tried in vain to stop cross-border infiltrations by Islamist extremists from neighboring countries in support of the Xinjiang insurgents. The U.S. military operations in Afghanistan thus brought the unexpected but welcome result of weakening what China considers terrorist threats from neighboring Afghanistan. It was therefore not surprising that Beijing at one stage gave serious thought to a discreet U.S. request to open a new supply line from China for the U.S. forces in Afghanistan through the Wakhan Corridor. With the Americans leaving Afghanistan and the Russians still too traumatized by their own bitter experience in this country to want to return, China alone has the capacity to fill the geopolitical void in this part of the Eurasian Continent. Aware of this new role for itself, China has been preparing the ground, starting with investments in closer political ties, economic development and infrastructure building, while exploiting its carefully honed neutrality to nurture relations with the Taliban, which promises to remain a potent political force in postwar Afghanistan. But this issue of insurgency among the Uyghur population in Xinjiang nonetheless represents a major glitch in this Westward Strategy. If Beijing adopts a hardline approach to solving this problem, it runs a high risk of being labeled a Muslim oppressor, which will certainly derail its effort to build a corridor of friendship through predominantly Muslim Central Asia. Consequently, notwithstanding the deep political tremors from the suicide attacks in Tiananmen Square, Beijing can hardly allow itself to respond with all-out repression of the minority Uyghurs in Xinjiang. In the near future, assuming the Westward Strategy has a successful outcome, the supply of energy resources from the Middle East to China will probably follow two new routes: (1) from the Mideast by sea or pipeline to Pakistan’s Gwadar Port, and then via pipeline to Xinjiang; (2) a direct pipeline route from Iran via Afghanistan into Xinjiang. With these new routes overland, China will achieve major savings in time and energy compared to the traditional sea route. More than that, the land route will be strategically much safer than the sea lane, which takes vessels past countries that are not necessarily friendly to China, and in waters that feature pirates and U.S. fleets. To China’s west on the other hand, from Central Asia to the Middle East, no country falls within the sphere of direct U.S. influence or poses a potential threat to China. Viewed from this angle, China’s Middle East diplomacy of supporting Iran and its partners, such as Syria, has some logic. Based on the same considerations of efficiency and geopolitics, China seems also to be exploring the possibility of a third energy supply route, through Southeast Asia. Over the past few years, China has been energetically promoting its high-speed railway technology to Southeast Asian countries. The promotion pitch – it now runs the world’s largest network of high-speed lines – experienced a setback with the infamous 2011 railway accident and the unveiling of large-scale corruption at the Ministry of Railways. But the September and October tours of Southeast Asia by Chinese top leaders Xi Jinping and Li Keqiang have helped to revive the sales pitch and the Chinese are definitely back in competition against Japanese and European consortiums. For the time being, Thailand is the primary target of the railway projects being proposed by different countries, but the Chinese plan calls for eventually building an extensive network of high-speed lines from Kunming in Yunnan Province to Singapore, passing through Laos, Thailand, Myanmar and Malaysia. It is easy to imagine the economic impact on the region should this project ever reach completion. But Beijing’s ambitions apparently go further. The point to note is that this rail link passes through one or more ports in Myanmar. A conceivable scenario would have energy resources and other raw materials arriving by sea from the Middle East unloaded at a port in this more or less China-friendly country, and then transported by rail straight into Yunnan and the rest of the Chinese interior without having to be carried through the Malacca Straits, the South China Sea or the East China Sea. That would have a direct impact on Singapore’s status as a regional maritime hub. It would also reduce maritime traffic in the South China Sea. Of course, China’s drive to expand its influence to the west and south, in parallel with its eastward expansion to the sea, is not entirely motivated by energy needs. Moreover, its strategy will depend on many geopolitical and strategic factors, including the intentions of other powers, such as the U.S., Russia and India. For countries east of the Malacca Straits, it remains to be seen how China’s assertiveness in the South China Sea and East China Sea will be altered by the completion of new supply routes. Although it is unrealistic to expect China to abandon its goal of becoming a maritime power, one might reasonable hope that China will adopt a slightly more relaxed posture to its east once it has achieved new energy security via its west. Yo-Jung Chen is a retired French diplomat. Born in Taiwan and educated in Japan, he has served in Japan, the U.S.A., Singapore and China. Strategic issues are not the only driver behind the recent incidents involving Chinese fishermen.